Charlotte Cottage, a cottage hospital, was built in Leighton Road by the Rothschilds in the 1884. Before that, there was no formal medical care in Wing and the nearest doctor would have been at Leighton Buzzard. Wing’s first official resident doctor, Dr Alfred Leigh CHIGNELL, arrived in Wing by 1899 and is listed in directories until 1924. He didn’t own his house, a few doors down from the hospital, as that was owned by Seth Denchfield (at least it was prior to Seth’s death in 1909 when it was up for sale). Dr William J LANGLEY is listed as physician and surgeon in the 1935 directory. By 1939 the village doctor was now Grant Alan HAMILTON who lived-in at Charlotte Cottage. The same year there is mention of another doctor of Wing, A. C. Grant, who gave medical evidence at an inquest for an accidental death of a motorcyclist in Stewkley attributed to the blackouts imposed in WWII. 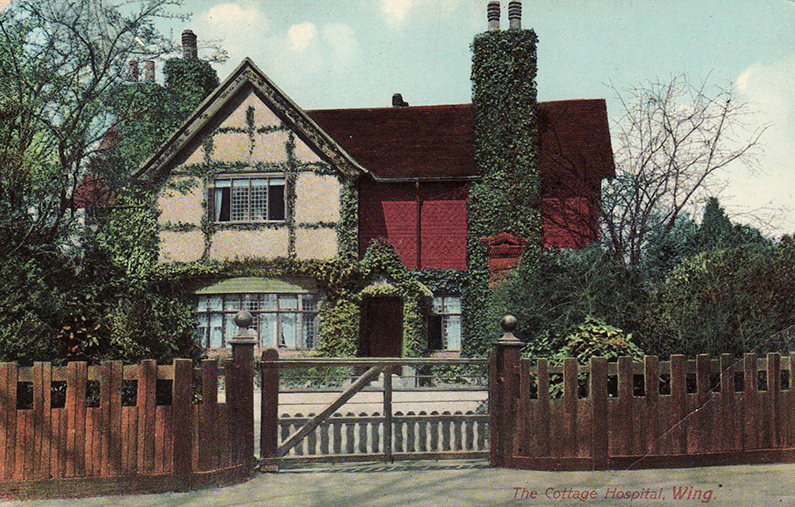 The matrons of Charlotte Cottage were Miss KING (in the 1887 and 1891 Wing directories), Mrs Kate JAMES (listed in the directories from 1895 to 1920), Miss Mildred JONES (1924 to 1931), and Louise MUDIE (1935 to 1939). The hospital was very small, noted as having two beds. An “open-air room for consumptives” was noted as being recently added in the 1911 directory. One employee of the hospital was Lionel JORDAN, who had worked there at some time prior to WWI (mentioned in the North Bucks Times when reporting his death in 1915). In 1967 the Rothschilds donated the cottage to the village (specifically the Wing Hall Trust, so that the rental income from the cottage could help maintain the hall). In more recent times Charlotte Cottage became the police station, and in 2014 was partially converted into five one-bedroom residential flats. Healers of Wing that didn’t work at Charlotte Cottage include those who nursed for the Red Cross during WW1. Some of these were obviously dabbling and it didn’t work out, but some worked full-time for the duration of the war so must have had some skill and aptitude, even if not formally qualified. There is mention of a charitable “hospital” in Wing in 1691 (aka 3 William and Mary) but I haven’t viewed this document [C 93/44/12 at The National Archives]. This is likely to be a reference to the Dormers Hospital, the almshouses of Wing established in the 16th century, rather than a medical facility. In the 1662 Episcopal Visitation Book for the Archdeaconry of Buckingham (published by the Buckinghamshire Record Society) widow Anne TATNALL and Elizabeth FOWLER are noted as being midwives – an excommunicable offence as far as the Church was concerned. Elizabeth died in 1671 and her burial record in the parish records describes her a “a midwife of long and happy experience” which is a strong indication of her value to the community. Another midwife, widow Sarah Simons “ye old midwife” was buried on 30 Dec 1731. The book Wing As It Was states that Alfred BAKER’s wife Amy (in the early 1900s) was a midwife. Alfred is my direct ancestor and his wife’s name was actually Medora Jane, although they did have a daughter named Amy (who married William Bandy in 1895), so I’m not sure if this is a mistake in Medora’s name or if it was in fact their daughter who was the midwife.